So last Friday I wrote about yarn storage and the lack of space in my Cwtch. A few hours later I found myself trawling the local charity/thrift shops to see what they may have to store yarn in and I ....erm... came home with a wooden chair!!!! So now I have even less space in the Cwtch but it gave the perfect excuse to complete the first item of my Year of Projects - a very simple crochet cushion cover. It's made entirely from scraps - Noro Aya from Color Affection #1 for the front, edging from Caponcho and when the Noro scraps ran out the back was supplemented by the remaining Mille Colori from my Stitch Sampler Shawl, so it also put a big tick in the stashbusting box. Considering how easy it was to make (2 flat circles of htr) and how little time it took (one evening) I am ridiculously pleased with how it turned out. You can't beat crochet for a quick fix of colour and creativity alongside bigger knitting projects, and as Nuvem is going to take forever (well, a few more weeks at least) suspect there may be a few more little crochet FOs coming up. In the meantime, head over to Tami's to see what others have completed this week. Wow Sarah that is so lovely. I am wishing I could crochet. No finished objects from me today but lots of circles on my newest sewing bloggy post. Check it out if you have a mo'. Lovely colours.I love a bit of quick crochet. It grows so much faster than my knitting. I will have a look this weekend to see if I can add to the Bee Keeper for you. Lovely and yay for using up scraps. Crochet is just so much quicker than knitting, but some things just need to be knitted! Someone else mentioned "bashing" something out in crochet, and really it does feel like that, doesn't it? Good for you for all that stash busting, and you must certainly be the first one over the finish line in the Year of Projects Group! But the most amazing thing is how well it complements the chair and the throw draped over the back of the chair! Well done indeed! I've seen some lovely cabled knitted covers which are pretty tempting! 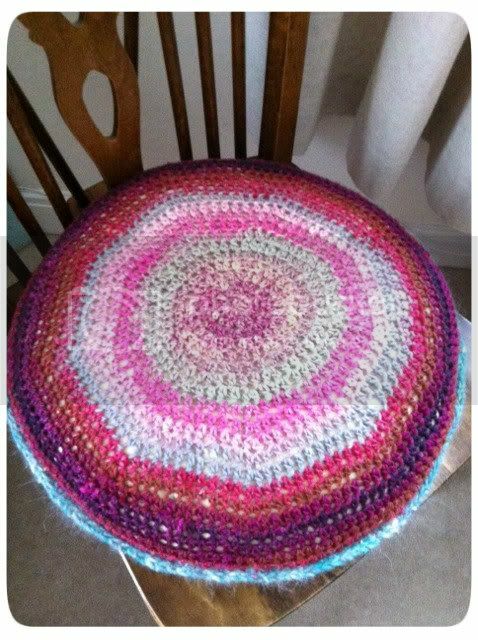 Great cushion, I keep meaning to make a circle cushion, but it's still not happened.....crochet is the best for instant zing isn't it? Not sure sun is on the menu this weekend......but keeping my fingers crossed! It's great! What a beautiful upcycled project! It's a lovely cushion, the colours of Noro really are quite something aren't they. I hadn't realised that your lovely doll was as big as that, she really is fab. Oh yeah, Pixie Moon is quite big - perfect for little arms to cwtch! My daughter loves her. I'm so pleased with the way the cushion turned out I'm going to keep my eye out for any bargainous Noro - celtivccove/stash often have it in their clearance. I wouldn't mind some more! Ahh, what an excellent way to use up scraps! Have a happy weekend. Lovely cushion, and I can see why you had to buy the chair. I'm going to the thrift store first thing on Monday with a long list but you never know what you will find. Lovely cushion made from your stash. I just finished an afghan using my stash. The chair was a great find. You are too cute, Sarah! I love wood. It's so earthy and sturdy. I admire how you waste not. I love how you styled the new pillow in the second pic. Too cute. 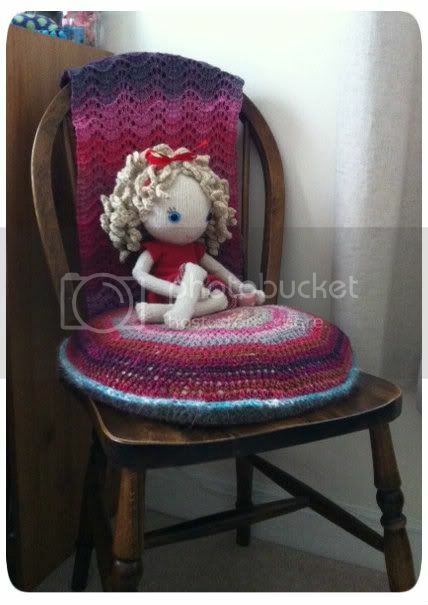 That's such a cool cushion, and it has to be said your little doll looks pretty comfortable sitting there. Gorgeous! Wow! First one with a finished project in YOP! You go girl! Only 1 night? I may have to do that! It looks so nice on your chair too. I don't really have a stash in fact I am anxiously awaiting yarns I ordered. I love your shawl too....all knit? REALLY??? I love to knit...the knit stitch. I'm a fairly new knitter so my YOP has skill building skills for knitting! Great job!